Will the Rolling Stones Tour the World to Celebrate Their 50th? Politics, not music, is usually my beat (no pun intended). But when I woke up this morning with the songs "Moves Like Jagger" and "Rumour Has It" doing a mashup in my mind, I had to consult the cards. Rumors have been swirling that the Rolling Stones are planning a world tour to celebrate their 50th anniversary. Mick Jagger denies the rumor, but the cards confirm it. 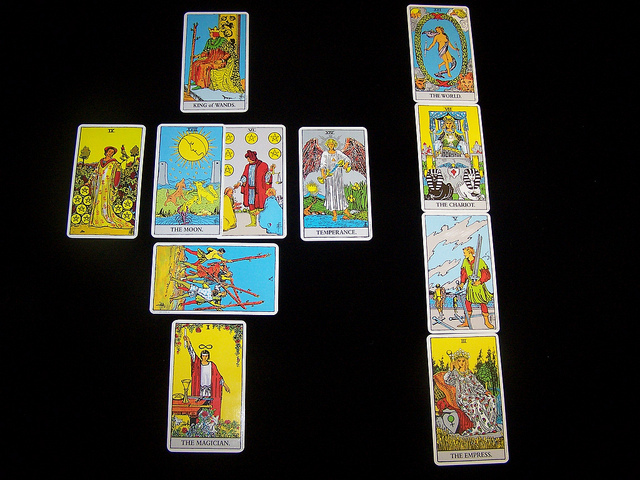 The Five of Wands indicates that there has been struggle and conflict within the band over financial reversals. The Moon card covering the Six of Pentacles, and the Five of Swords would indicate that an attorney, manager or financial advisor provided bad advice that was costly. There was deception involved, and now the band is embroiled in a fit of finger pointing. You don't need a crystal ball to predict dissension in the ranks of a rock and roll band. On the contrary, what has been truly unpredictable is the band's longevity. The Magician card in the Foundation position gives due credit to Jagger's masterful ability to hold the band together -- if not through magic then through sheer force of will. The Chariot card in the position of Hopes/Fears would say that Jagger is hoping he can keep the wheels from coming off before the band makes it to their 50th anniversary. The King of Wands and The Empress cards show that Jagger has deep reservoirs of creative inspiration at his command. But, unlike most rock-and-rollers, he also has a good head for business (which he studied at the London School of Economics). The Nine of Pentacles contrasted with the Temperance card would suggest that Jagger will be setting a more balanced, austere tone, different from the wine, women and song extravagance of the old days. The World card fell in the Outcome position. In a reading about a world tour, that card really needs no interpretation.